Individual Chicken Pot Pies are perfect for a nice dinner at home! Baking and Pastry is not the only thing that keeps me in the kitchen. I usually have a home-cooked meal on the table every night – which is a pretty amazing feat with a 4-month old. Growing up, my Mom made dinner for us almost every night. We had the occasional pizza night, but we always ate together. Sitting as a family around the kitchen table is something I truly cherish from my childhood. It didn’t matter if we had homework or sport practices, we took a break and ate dinner together. That is how I was raised and that is how I want to raise my daughter – to take time out from our busy lives and share a meal. I don’t want to eat dinner alone, or fight to have a conversation over the television; I want to spend what little time I have eating a meal with the ones I love. I may not make everything from scratch, and the slow cooker is my best friend lately, but I try and that is what counts. I make food with love – that’s how my Mom and Grandmother made it and that is the most important lesson I have ever learned, do everything with Love! I have only been blogging about the “confections” in Love and Confections. Now I am going to start posting about the Love too – the savory side of my life and the love of cooking for my family. – Heat oven to 350F. 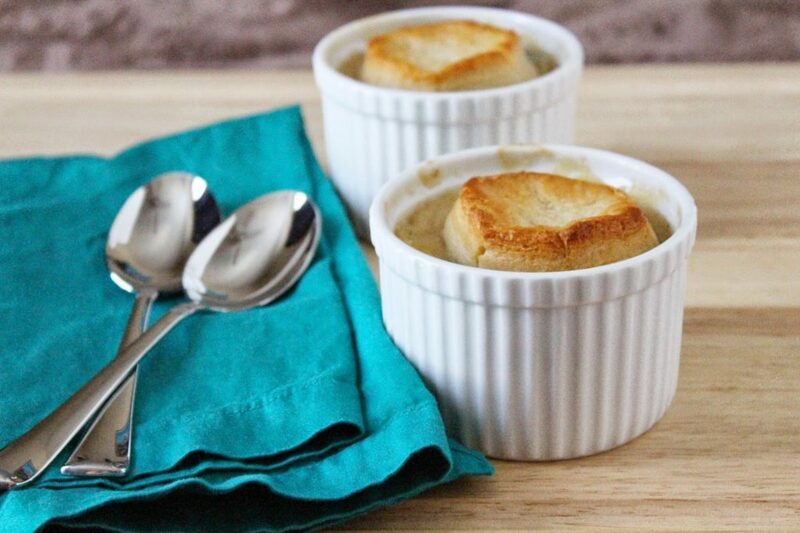 Place 8 ramekins on a sheet pan with sides. – Heat Chicken Stock in a medium pan. – In a large pot melt the Butter and add in the chopped Onions. Cook the onions until they are soft and translucent. Add in some Salt and Pepper to your liking. – Sprinkle Flour over the onions and butter and stir to coat. The flour needs to be completely combined and cooked with the onions so it doesn’t have a raw taste. – Slowly add the Chicken Stock to the large pot, stirring while combining. – Add in the Chicken and Frozen Vegetables. After everything is combined, add in the Heavy Cream. – Stir often and salt and pepper to taste. It will thicken as it cooks – about 10-15 minutes or until the vegetables are to your liking. If you don’t like slightly crisp veggies you can pre-cook or steam them to soften. – Bake in the oven for 14 minutes, or until the biscuits are golden brown and done, Let it cool slightly before eating. Enjoy!